Toyota Tundra » Does the 2019 Toyota Tundra Have a Backup Camera? Have you heard? The 2019 Toyota Tundra is finally here! Toyota’s widely-popular full-size pickup truck is back for 2019 and looks to be better than ever! 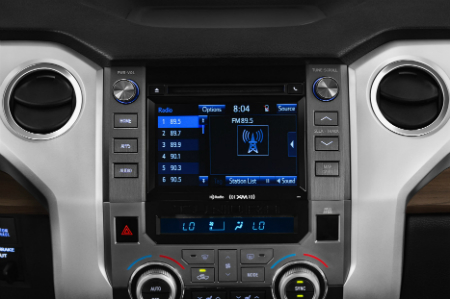 We know that the Toyota Tundra can hang with the best of them when it comes to muscle, but what about technology? For instance, does the 2019 Toyota Tundra have a backup camera? Drivers of large pickup trucks know that, sometimes, it can get a little tight in some areas. That’s why having a backup camera can be so helpful when it comes to squeezing into tight corners and spaces. When it comes to the 2019 Toyota Tundra, you don’t have to worry because it comes with a standard backup camera! That’s right, the 2019 Toyota Tundra comes standard with a wide-angle backup camera, so drivers always know exactly what’s behind them when it comes to driving in reverse! And, the camera is standard, so you don’t have to pay extra to get the best features! Need to put the boat in the water off the trailer? The backup camera is there! Need to parallel park? It’s never been easier than with the 2019 Toyota Tundra’s backup camera! This entry was posted on Thursday, November 1st, 2018 at 2:00 pm	and is filed under Toyota Tundra. You can follow any responses to this entry through the RSS 2.0 feed. You can skip to the end and leave a response. Pinging is currently not allowed. How Efficient is the 2020 Toyota Corolla?